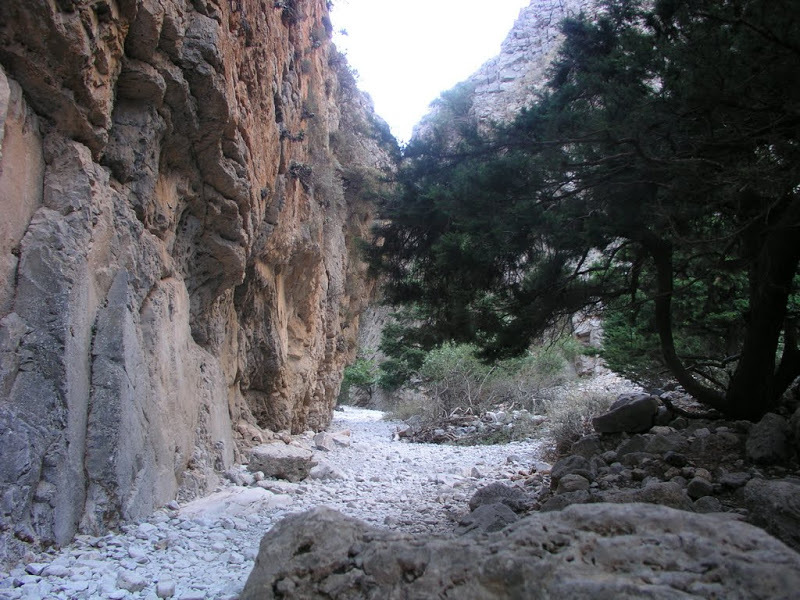 Imbros Gorge, close to Chora Sfakion, is the second most popular gorge on Crete after Samaria Gorge. During the high season hundreds of walkers visit daily to make the trek through the valley. The walk is not particularly strenuous and can be completed in 2-3 hours. The scenery is beautiful and the relative easiness of the hike makes it an ideal walk for families with children. The length of Imbros Gorge is 11km. The walk begins at the small village of Imbros, 700m above sea level. If you take the walk in spring or autumn, warm clothes are recommended to combat the cooler weather. After a few hundred metres you reach the entrance to the gorge. The first half hour of walking is downhill, with the gorge getting narrower along the way. After 75 minutes or so you'll find yourself in the narrowest, most spectacular spot of the gorge. The walls of the gorge here are less than 2m apart and tower 300m above. Fifteen minutes more down the gorge is a pleasant resting place. In contrary to what many traveller's books say, there are no fresh water vendors here, and not even a water tap. So be sure to take enough water with you. Another highlight of the gorge is the so-called gate rock, a further ten minutes walk on from the resting place. You can take some really nice photos here. Walking through the gate, the gorge widens out again and after one more hour you΄will find yourself at the end of the gorge, where two tavernas are waiting for thirsty, hungry walkers.